The last ten years have witnessed a renewed interest in cellulose research and application, sparked mostly by technological interests in renewable raw materials and more environmentally friendly and sustainable resources. We have come across that cellulose based paper can produce a bending displacement in the presence of electric field. This smart cellulose is termed Electro-Active Paper (EAPap). It can produce a large bending displacement with low actuation voltage and low power consumption. 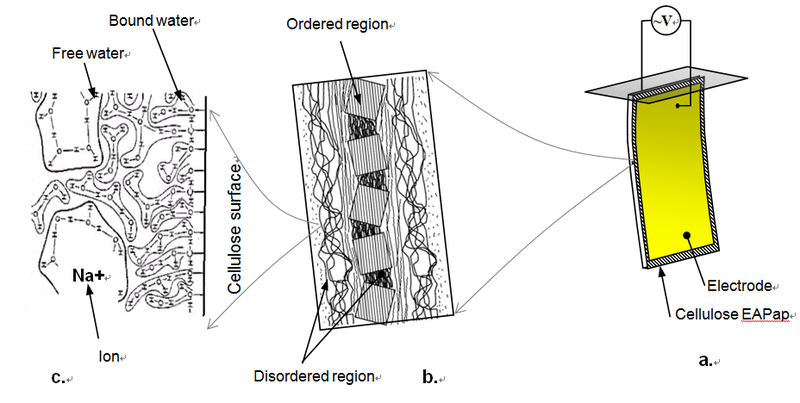 a. Cellulose microfibril has ordered crystalline regions and disordered regions. b. EAPap is made from cellulose paper on which gold electrodes are deposited on both sides. c. water molecules are bonded with hydroxyls on the cellulose surface (bound water) or clustered in free (free water). First discovery of EAPap actuator(2000). Dragon wing made with cellulose EAPap actuator.